120mm x 180mm, 5" x7"
Fully updated and includes downloadable GPS waypoints. This new edition has been rewalked in both directions - from Chepstow to Prestatyn and from Prestatyn to Chepstow and reformatted for use by walkers hiking south to north and north to south. 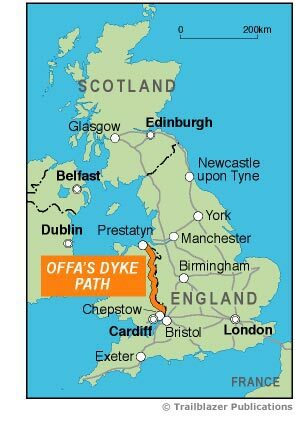 The Offa's Dyke Path is a superb National Trail that runs from the North Wales coast to the Severn Estuary following the line of Offa's Dyke, an impressive 8th-century earthwork along the English/Welsh border. The ever-changing landscape – the Clwydian Range, the Shropshire Hills, the Black Mountains and the Wye Valley – is steeped in history and legend providing 177 miles (285km) of fascinating walking. Includes 98 detailed walking maps: the largest-scale maps available At just under 1:20,000 (8cm or 3.15 inches to 1 mile) these are bigger than even the most detailed walking maps currently available in the shops. Unique mapping features Walking times, directions, tricky junctions, places to stay, places to eat, points of interest. These are not general-purpose maps but fully-edited maps drawn by walkers for walkers. Itineraries for all walkers Whether hiking the entire route or sampling highlights on day walks or short breaks. Detailed public transport information for all access points. Practical information for all budgets What to see, where to eat (cafés, pubs and restaurants); where to stay (B&Bs, hotels, bunkhouses, hostels & campsites).